Creating a beautiful and inviting table doesn’t have to be a chore, a couple key elements make it easy. Instead of using a tablecloth or placemats, show off the beauty of your table and use chargers. Chargers are a great way to protect your table from damage due to heat from food, and a fantastic decorative element. I purchased these distressed white chargers at Kirklands (HERE) at 50% off. Pairing the chargers with everyday plates and bowls makes for a beautiful vignette. I used white napkins from Pier One (HERE). White table napkins are classic and an essential element to any tablescape. If you only buy one color for your table, you can never go wrong with white. Pier One always has such a great assortment of table linens and table accessories. No tablescape is complete without fresh flowers. 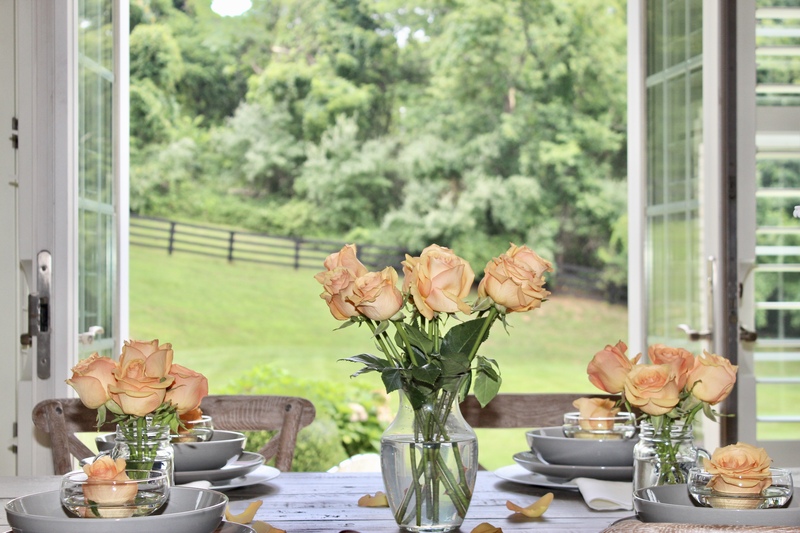 Roses, of course make a perfect centerpiece. I purchased 2 dozen roses at Target for $12.00 – can’t beat that! Mason jars (HERE) are always pretty paired with flowers, and are a very inexpensive way to decorate a table, not to mention the hundreds of craft projects involving mason jars. Using glass dessert bowls (HERE) are another way to decorate your table. I have a set of glass appetizer/desserts bowls I use all the time for different reasons and occasions, they always come in handy. On this table I used the footed bowls, I cut the stems of the roses and they are floating in water. The candlesticks on the table have been given new life using milk paint. You can read that post (HERE). Open up those doors and bring the outdoors in, another great way to create a summer mood. Bon Appetit mes amis and Happy Mother’s Day! Very cozy space and views, love it! I love this! Thank you Happy Haute Home for giving me some great ideas! You are more than welcome! Thanks for stopping by! lovely ideas. I just love the theme colours your made. and the green garden outside made it more fresh and cool. Amazing and beautiful! Thank you! So sweet of you to comment.